The outcome in cyclist-motorist accidents is often disastrous for the cyclist. With no real protection around them, cyclists are particularly vulnerable in a crash. There are many causal and contributing factors in cyclist-motorist collisions, but foremost is when motorists fail to check for cyclists before turning left, right or advancing at an intersection. American studies of cycling accidents have concluded that the driver’s failure to look properly, especially at intersections, was a contributory factor in 57 per cent of cycling-motorist collisions. Although less common, the cyclist’s failure to look properly was also often problematic in fatal collisions for the cyclist. Anyone injured in a biking accident due a careless action by a motorist is entitled to sue the negligent driver for damages resulting from their injury. As well, cyclists who are seriously injured in any motor vehicle accident, can make an accident claim to their insurance company, their family’s insurer or the driver’s insurance company. This benefit is particularly helpful for cyclists injured in hit-and-run accidents in which the negligent motorist is never identified, which unfortunately happens all too often. 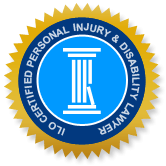 Talk to an Injury Lawyers of Ontario (ILO) cycling accident lawyer to find out about your best options for obtaining compensation for yourself or a loved one. Who’s at fault: motorists versus cyclists? It would be ridiculous to suggest that any one group is always at fault in these accidents. When cyclists do not pay attention to traffic regulations or fail to wear gear, such as bike reflectors and lights during twilight and at night, they put themselves at risk of collision and serious injury. Similarly, motorists who fail to yield the right of way to cyclists, are inattentive to other road users, or drive recklessly, are more likely to crash into and seriously injure a cyclist. Motorist proceeded into an intersection, turning right or turning left before it was safe to do so. Motorist passed the cyclist too closely. Motorist opens the door in the path of a cyclist (‘dooring’). These conclusions, in terms of cyclist-motorist accidents, may not be exactly replicated in other communities in Ontario in terms of the numbers of accidents where the motorist is at fault; however, these key reasons for biking collisions are reported in study after study in North America. Further, numerous studies have found that where people cycle and walk in greater numbers, there are fewer and fewer collisions with motorists. Logically, we can conclude that motorists are generally more attentive to cyclists when they expect to see them on the road. Correspondingly, in Ontario communities where there are few cyclists, there are likely to be more collisions on a per cyclist basis. The challenge is for drivers to make it a practice to always check for cyclists before proceeding, particularly at intersections. The Office of the Chief Coroner recently sponsored a study of cycling deaths in Ontario that occurred over a five year period. The hypothesis that ‘cycling deaths are preventable’ was proven true in every cycling fatality studied. The most common event in cyclist-motorist collisions involved the cyclist being hit from behind by the vehicle’s windshield, hood or bumper. As a result, the bicyclist was typically projected, run over, pinned or dragged. In collisions with large trucks, the cyclist was often hit by the side of the truck, then dragged or run over by the truck’s rear wheels. Almost 20% involved crashes with other objects or involved falling off a bike. Only 27 per cent wore a helmet. 65 per cent were in urban centers. More biking fatalities occur on rural roads, per cycling mile travelled. Head injuries, including concussion, non-fatal skull fractures and cuts. Around three quarters of fatalities in cyclist-motorist accidents are caused by severe injuries to the head and brain. In some cases, drivers were found to be negligent in multiple behaviours. Charges were laid against the drivers in 30 per cent of the cyclist-motorist collisions studied by the Coroner’s Office, which included impaired driving and distracted driving charges. The Making Ontario’s Roads Safer Act (Bill 31) was in part a response to the findings of the Office of the Coroner’s report on cycling safety. Effective September 1, 2015, the following cycling safety regulations became law in Ontario. Dooring cyclists will result in 3 demerit points and a $365 fine. Drivers must leave a 1 meter distance when passing cyclists, wherever possible, or face two demerit points and a $110 fine (fines increase to $180 in community safety zone). Inadequate bike lights (from ½ hour before sundown to ½ hour after sunset) will result in a $110 fine. Many drivers have voiced criticisms in Ontario social media sites, of some of the fines and laws put in place to protect cyclists, particularly of the requirement to leave one meter distance when passing. This is a disturbing movement as it suggests that some drivers are not yet prepared to share the road with cyclists. Most European nations have attained a positive relationship between cyclists and motorists, and along with the far greater numbers of cyclists, one of the reasons for greater success in sharing the road is that there is better infrastructure to accommodate safe cycling. If municipalities, like Toronto, incorporate bike lanes and streets closed to vehicular traffic, we will likely see a further reduction in cycling collisions. In the interim, drivers and cyclists need to be more attentive of other road users. The Injury Lawyers of Ontario (ILO) law group has represented many cyclists who were seriously injured in a collision due to a negligent driver. We understand that the impact on your life and the lives of family members is often dramatic, in terms of a disruption in the ability to work and to complete normal chores. Injured persons are often struggling with pain, difficulty sleeping and mobility challenges during their healing process. As an injured person, the compensation you receive in an accident suit or accident claim allows you to pay for medical treatments and to have a source of income, without losing your life savings. The amount of benefits available to an accident victim, whether you decide to sue for damages or make an accident claim, depends on the severity of your injuries and how much your life is affected by the accident. If you were unable to work as a result of serious injury, you will be entitled to ‘loss of income’ compensation. You may also be able to claim for medical and rehabilitation expenses, housekeeping and home maintenance benefits, pain and suffering, and family expenses. In White v. Aransibia, 2003, a cyclist sued the driver of the car that struck him, causing a serious closed head injury and skull fractures. As a result of his injuries, the cyclist, Mr. White, suffers from serious cognitive problems and a personality change that affects his work performance and home relationships. In the 2003 civil trial, Mr. White sought only general non-pecuniary damages (for pain and suffering) for his personal injury because he had applied for pecuniary benefits for his financial losses under Bill 164. The accident occurred when a northbound motorist turned left from Kennedy Road onto Orenda Road in Brampton, colliding with Mr. White who was travelling southbound on Kennedy. Mr. White was riding on the sidewalk because it made him feel safer. He was not wearing a helmet and had consumed some alcohol with dinner just prior to the collision. The judge was convinced that Mr. White’s injuries were permanent and serious, and awarded $100,000 in damages for pain and suffering. However, liability was assessed as 50/50 for Mr. White and the motorist because Mr. White was deemed to have been travelling at excessive speed and did not stop before proceeding across the crosswalk. He also had no reflectors or light on his bicycle and it was presumed that he did not keep a proper lookout. In Pelletier v. Ontario (2013), Mr. Pelletier sued the Government of Ontario for damages that resulted when he was struck by a police car while riding his bicycle across an intersection at Gill and Front Street in Orillia. The 28 year old cyclist sustained serious head injuries, brain injury, a broken leg and a fractured vertebrae. He was permanently disfigured and suffers from post-traumatic stress syndrome (PTSD) following the accident. Although the Orillia police officer was deemed to have the right of way at the intersection, the court concluded that the officer’s poor reaction time was partially responsible for the collision. The officer’s failure to stop in time was attributed to excessive speed, a lack of caution and a failure to keep a proper lookout. These conclusions influenced the judge’s findings of 60 per cent liability on the part of the officer. Mr. Pelletier was found 40 per cent liable because he failed to yield the right of way at the intersection. Mr. Pelletier’s damages were assessed at $3,195,000 for future attendant care costs and $1,167,000 for cost of attendant care for outings. Mr. Pelletier was also awarded $112,500 for a loss of future earning capacity and general non-pecuniary damages of $250,000 (for pain and suffering). Statutory Accident Benefits (SABS) are accident benefits under every automobile insurance policy, which are available to anyone injured in a motor vehicle accident in Ontario. If you choose to file a motor vehicle accident benefits claim, you need to inform your insurance company of your injuries within seven days of the accident, and subsequently fill out an Application for Accident Benefits provided by your insurer. Some of the benefits you may be able to claim are: income replacement, non-earner benefit, caregiver benefits, attendant care benefit, medical and rehabilitation expenses, educational expenses and funeral and death benefits. ILO lawyers specialize in negligence actions and accident insurance claims. We offer a free consultation to allow you to have all your questions answered and to learn about your options in terms of making a claim for damages. If you decide to go forward with claim, our goal is to get you the maximum compensation you are owed, and in most cases, we are able to negotiate a settlement without having to go to trial.